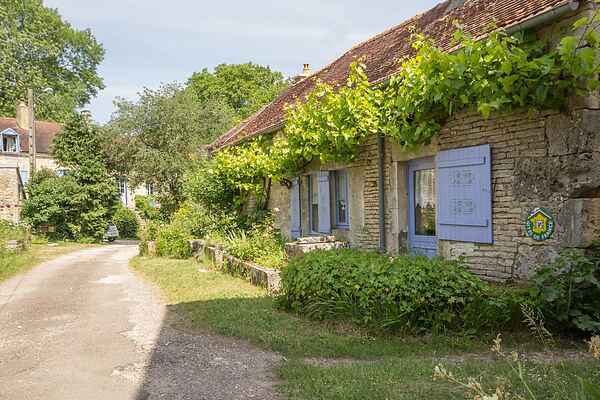 This cozy holiday home is in the village of Planay in Côte-d'Or, in Burgundy. A region of forests, vineyards and meadows. Your home is located in the quiet little village of Planay, with charming medieval villages like Noyers 36 km away. A visit to one of the many castles that once were inhabited by Burgundian dukes is a must. Castle Ancy-le-Franc (20 km) for example is one of the most beautiful Renaissance castles of Burgundy. Or Fontenay Abbey (30 km) which is on the Unesco World Heritage List. The monastery and the church are still intact. Also visit the ancient and picturesque Vézelay, built on a hill (70 km). Vézelay is famous for its abbey church and the wine. Near the medieval town of Semur-en-Auxois (40 km) is a large recreational lake: the \"Lac du Pont,\" with a beach and various water sports. In Semur you wander through picturesque streets and visit the 13th-century church. Be sure to visit one of the many wine cellars and choose the most delicious wines. Especially enjoy the delicious food and the Burgundian way of life!